Some of our stunning range of stylish designer dog collars are handmade for us here in Britain. Choose from luxury soft padded leather dog collars or a selection of exquisite fabrics and rope dog collars in many different colours and patterns that will look fantastic on your dog. Most of our designer dog collars have matching leads to complete the look. We have a wide range of luxury dog collars including those made by top brands Mutts and Hounds, Dogs and Horses and Scrufts. Choosing a dog collar may be easy for some but when you see our massive selection of the finest designer dog collars your bound to have a hard decision to make. First things first, are you looking for a luxury leather dog collar or a stylish fabric dog collar? Our selection of leather dog collars includes the ranges by top designers Dogs and Horses, Furry Necks, Mutts and Hounds and Tallulah Couture. From simple rolled leather dog collars to exquisite leather dog collars with hand stitched crystals and beads, there’s a leather dog collar for all breeds of dog in our store. 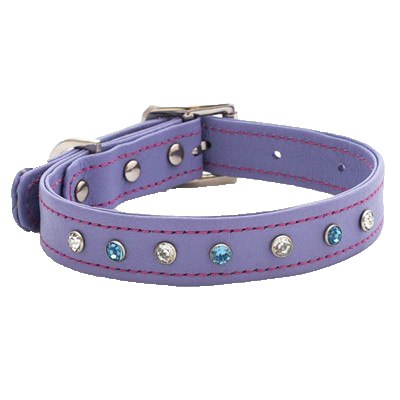 Fabric dog collars are the perfect choice for everyday collars or house collars. Handmade to order for us by designer Scrufts in the UK, our stylish fabric dog collars are sure to please. Each lined with luscious velvet in either a complimenting or contrasting colours, they are all finished with a heart shaped tag. Choose from a large selection of fabrics from stripes and spots to flowers and tweeds, there’s a designer dog collar for every breed of dog. At Chelsea Dogs, most of our designer dog collars have matching leads available or are sold as sets so your dog will look stylish and feel great when out walking in the park. We have recently introduced a new dog collar fashion to our range, the bow tie dog collars. Our bow tie dog collars are also handmade in the UK and come in various fabrics including tweed, red gingham and the very colourful Mr and Mrs Punch.